Aston Roving Bridge is a minor waterways place minor waterways place place on the waterways major waterways place village town city on the Birmingham Canal Navigations (Birmingham and Fazeley Canal - Main Line) between Salford Junction North (Junction of B&F and Tame Valley Canals) (1 mile and 6 furlongs and 11 locks to the northeast) and Aston Junction (Junction of B&F and Digbeth Branch Canals) (a few yards to the west). 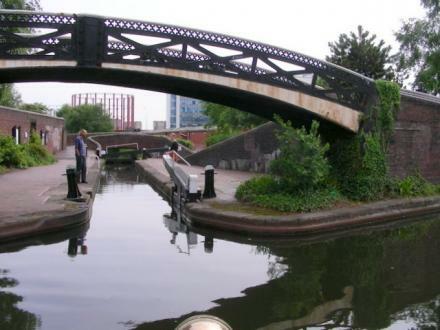 The nearest place in the direction of Salford Junction North is Aston Top Lock No 14; a few yards away. 112 Corporation Street, Birmingham — 1155 yards to the southwest. 8 Bennetts Hill, Birmingham, B2 5RS — 1517 yards to the southwest. The Bullring Shopping Centre, Birmingham, B5 4BE — 1609 yards to the south. 139 New Street, Birmingham, B2 4NU — 1541 yards to the southwest. Aston Triangle, Birmingham, B4 7ET — 510 yards to the south. Upper Mall East, Bullring, Birmingham, B5 6 — 1557 yards to the south. 3-5 St Pauls Square, Birmingham, B3 1QU — 1382 yards to the southwest. Bullring Shopping Centre, Spiceal Street., Birmingham, B5 4BE — 1585 yards to the south. Aston — 1541 yards to the north. Moor Street, Birmingham, B4 7UL — 1435 yards to the south. 14-16 Temple Street, Birmingham, B2 5BG — 1528 yards to the southwest. 39-40 Temple St, Birmingham — 1545 yards to the southwest. The Alchemist Birmingham, The Grand, Colmore Row, Birmingham, B3 2DA — 1297 yards to the southwest. 20 Bennett’s Hill, Birmingham, B2 5QJ — 1564 yards to the southwest. Birmingham — 1182 yards to the southwest. 18 Barwick Street, Birmingham, B3 2NT — 1277 yards to the southwest. Steelhouse Ln., Birmingham — 771 yards to the southwest. 4 Temple Row West, Birmingham, B2 5NY — 1410 yards to the southwest. 67-71 Temple Row, Birmingham, B2 5LS — 1402 yards to the southwest. Steelhouse Lane, Birmingham, B4 6NH — 758 yards to the southwest. Birmingham, B7 4 — 1044 yards to the south. 7 Bennetts Hill, Birmingham, B2 5ST — 1510 yards to the southwest. 8 Temple St, Birmingham, B2 5BN — 1458 yards to the southwest. Somerset House, 37 Temple Street, Birmingham, B2 5DP — 1480 yards to the southwest. Church Street, Birmingham, B32 — 1307 yards to the southwest. Unit 30, Grand Central, Stephenson St., Birmingham — 1601 yards to the southwest. Millennium Point, Curzon Street, Birmingham, B4 7XG — 943 yards to the south. Bullring, Birmingham, B5 4BU — 1580 yards to the south.